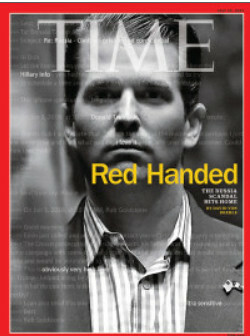 This is Time Magazine's cover this week featuring Donald Trump, Jr. Check out the larger version and the white writing on it. Here's a funny article from the UK Independent comparing him to "Fredo" Corleone. Shepard Smith has long been one of the few news anchors/talk show hosts I enjoy watching (and listening to in the car.) This rant against the Trump Camp for its "lies after lies" and his take on Donald Trump, Jr.'s evolving explanations of the Russian meeting is making the rounds. It's one of his best. Media Matters has the transcript. Journalist Wayne Barrett, who has written about Rudy Giuliani for decades, is back, with a scathing comparison of Rudy and Thump. He says the "the onetime comb-over twins just had too much in common" not to align with each other this time around. The New York Times has a new report on Trump's finances: Trump’s Empire: A Maze of Debts and Opaque Ties. His companies are $650 million in debt and have shadowy backers. Is Donald Trump running on empty? More Republicans are jumping ship and refusing to support Donald Trump and planning on voting for Hillary. More than 200 current and former Republican elected and administration officials, as well as figures from the party apparatus and the conservative media, have said in recent weeks that they simply cannot support Trump, citing his increasingly erratic statements, his lack of policy specifics and his recklessness on the international stage, with many of them saying they'd vote for Hillary Clinton instead. A 10 year old attending a Trump rally with his mother, Pam Kohler, of Mount Vernon, VA, stood up twice and yelled out "Take the b*tch down" when Trump mentioned Hillary Clinton's name. His mother identified herself to reporters as and stuck up for her son's remark. She said, “I think he has a right to speak what he wants to." Ms. Kohler and her son were sitting in the media section of the rally and according to the Wall St Journal, both were holding signs that said "Hillary for Prison.....Asked where he would learn such a phrase, she said, "Democratic schools"
The Washington Post published this incredibly harsh editorial today trashing Donald Trump. The real estate tycoon is uniquely unqualified to serve as president, in experience and temperament. He is mounting a campaign of snarl and sneer, not substance. To the extent he has views, they are wrong in their diagnosis of America’s problems and dangerous in their proposed solutions. ... A Trump presidency would be dangerous for the nation and the world. The New York Times has the most bizarre Trump speculation I've read to date. He may not want to be President, he may just want to win. And if he does, he may just decline to take the office, and go back to running his businesses, happy with all the media coverage he got, which he thinks would be good for business. Bob Corker has withdrawn his name from consideration as Donald Trump's running mate. Newt Gingrich is up next, appearing with Thump in Ohio today. I forgot about this very long Vanity Fair profile of Donald and Ivana Trump by Marie Brenner in 1990. It's frightening how little he's changed, and how the media knew he was full of it but kept writing about him anyway. On the Saturday of Donald Trump’s forty-fourth-birthday celebration, I tried to take a walk on the West Side yards above Lincoln Center in Manhattan. The railroad tracks were rusty, the land was overgrown. The property stretched on, block after block. .... The only sign of Trump was a high storm fence topped with elaborate curls of barbed wire to keep out the homeless people who live nearby. It was on this land, at the height of his megalomania, that Trump said he would erect “the tallest building in the world,” a plan which was successfully thwarted by neighborhood activists who were resistant to having parts of the West Side obscured in shadow. “They have no power,” Trump said at the time, baffled that anyone would resist his grandiose schemes. Trump was just interviewed on CNN. I missed the beginning because I had the TV on mute to block the last pundit I had listened to and didn't look up until he had already started talking. Here's the part I did hear. The cable news coverage of the cancellation of the Trump rally in Chicago today highlights why no one should be watching cable news for news anymore. It's all opinion. CNN just went from extended interviews with a former Romney campaign strategist to a former Secret Service agent to a current media person for Donald Trump. None of the three were there. All three were pushing biased talking points.